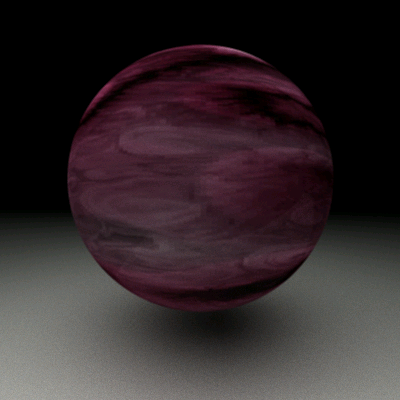 In Project 12, the Heyney-Greenstein Phase Function was implemented in the renderer. 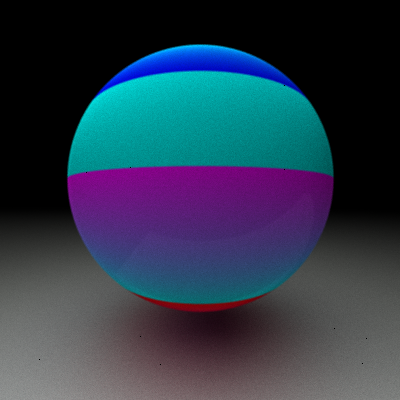 The Heyney-Greenstein Phase Function (HGPF) is an imperical formula to simulate diffuse and specular reflection for a variety of materials using only two parameters. This function uses these these two parameters stored in each object and takes the incidence angle as input. This provides a much greater flexibility for different materials than using the simpler Lambertian reflection. Finding little data as to proper values, I rendered an image using a wide range of values. From the image generated, it appears a high g-value seems important to produce a good image. This component supposedly relates directly to the angle where most of the light is leaving. 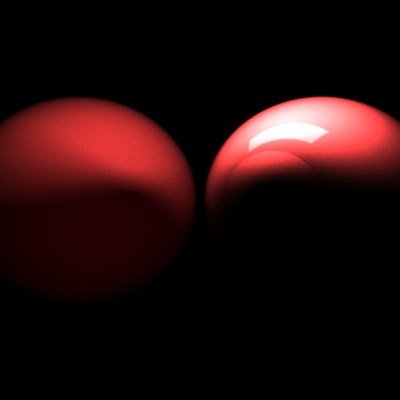 It seems natural that a g-value closer to 1 will produce better pictures where light bounces off at a 90-degree angle, while a 0 value gives very splotchy results. The w-value used in the function scales the function and seems to have less of an effect after tone mapping is appled. 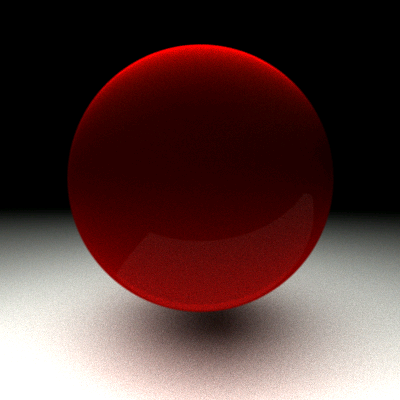 In Project 11, subsurface scattering is added to the renderer. This implies that light hitting the surface of the material enters and bounces around inside the medium before exiting. Many materials such as grapes, skin and marble exhibit this quality. 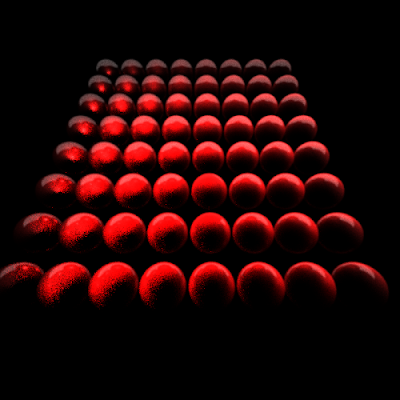 Subsurface scattering in this implementation used ray marching, where the ray enters the medium and bounces around until exiting. 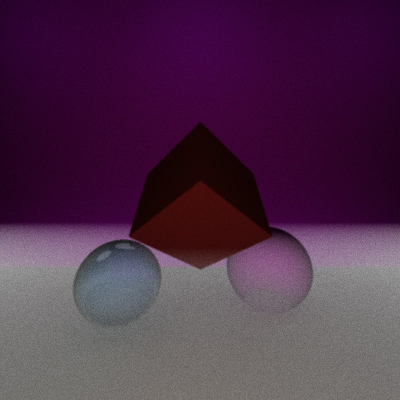 Because the ray actually bounced around inside the object instead of just off the surface, the rendering was far more computationally expensive than rendering this scene without SSC. In Project 10, we were to implement participating media. Participating media involves computing physical bounces of light in media such as fog, dust, smoke, etc. where the light bounces around inside the volume instead of just diffusing, reflecting, or refracting. To implement this, I used the standard marching technique through an axis-aligned bounding box. A ray was sampled multiple times across its vector using small steps. When these steps were inside the bounding volume, they probabilisitcally hit some of the media. In Project 9, we were to add the Beere-Lambert Law to our renderer. The Beere-Lambert Law models the amount of light absorbed while traveling through a medium. Because different wavelengths are absorbed based on the distance they must travel through the medium, different colors can be absorbed causing different wavelengths to be more pronounced. Certain types of glass often absorb high and low wavelengths leaving a greenish tint at certain angles. Usually this effect can be seen when the light is going through the greatest distance of the glass. To compute the absorbtion at certain frequencies, euler's number e was taken to the exponent of the distance times a large negative constant (which changes based on the scene metrics). 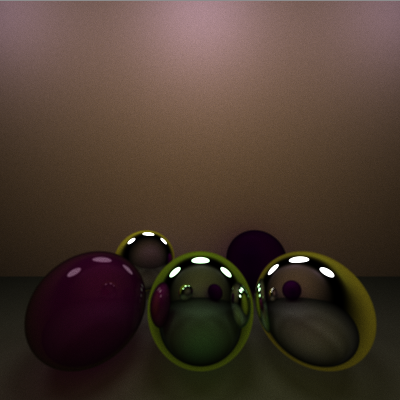 In the picture below, five spheres are modeled. 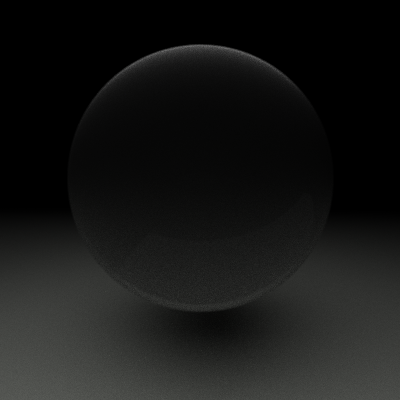 The back left sphere is a reflective sphere, while the back right is a diffuse sphere. 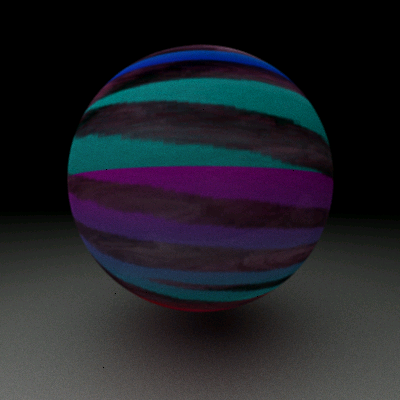 Theses spheres are only to provide background to the scene. The spheres in front are used for comparison. 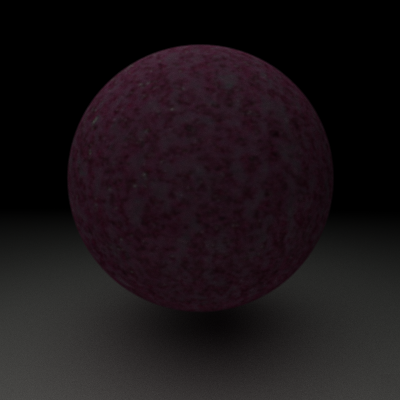 The left sphere is a diffuse/reflective sphere with a purplish hue. The middle sphere is a translucent sphere that implements the Beere-Lambert Law based on the distance of the medium. 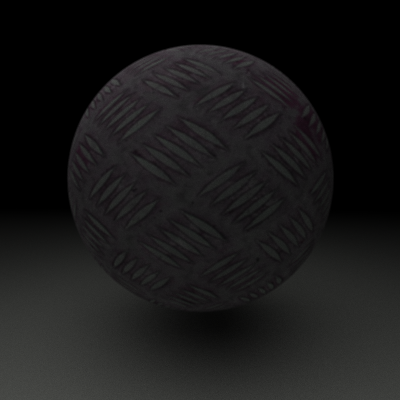 This gives the sphere the slightly greenish tint. The sphere on the right is also a translucent sphere, but does not implement the Beere-Lambert Law. This was to show the difference in hues generated by this principle. In Project 7, we were to use our renderer to model the Cornell box. This box was compared against a physical model to compare accuracy in the rendering software. 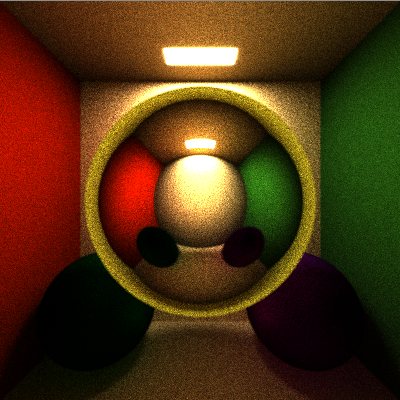 This scene's walls and light are modeled using the geometry data and color data from the Cornell box at http://www.graphics.cornell.edu/online/box/data.html. 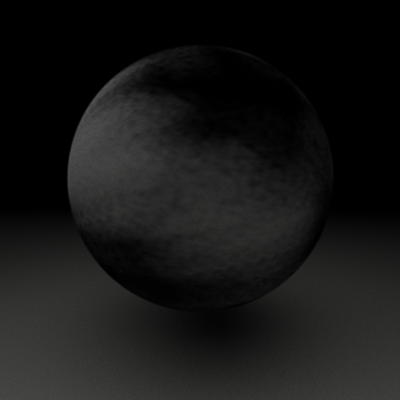 In addition to the light source and the walls, Project 8 added fresnel effects to the renderer. Instead of the two blocks found in the original Cornell box, two diffuse spheres have been placed in the far corners of the room. A large transparent sphere is placed in the center of the room, which shows the light refracting through it. The scene's light seems rather blurry because it was moved down slightly to not create artifacts with the ceiling, which is one giant polygon.